This week, we're celebrating Anthony Quinn's 100th birthday with a look at one of his most underrated films, The Ox-Bow Incident (1943). Here he is at far left with Dana Andrews; Henry Fonda; Frank Conroy, and Jane Darwell. Anthony Quinn was one of old Hollywood's greatest character actors. He made memorable appearances in many great films throughout the 1940s, 1950s, and 1960s, including Viva Zapata! (1952), Lust for Life (1956), La Strada (1954), and Zorba the Greek (1964). One of his most powerful performances is in the 1943 Western, The Ox-Bow Incident, where he plays an innocent man who is framed for murder and cattle rustling. Henry Fonda and Henry Morgan in The Ox-Bow Incident (1943). Quinn was born Antonio Rodolfo Quinn Oaxaca on April 21, 1915, in Chihuahua, Mexico to Manuela Oaxaca and Francisco Quinn (the Quinn comes from Francisco's father who was an Irish immigrant). Francisco moved his family first to El Paso, Texas, and then to Los Angeles, where he became a cameraman in the early film industry. Quinn dabbled in many fields before settling on acting. As a teenager, Quinn was deeply religious, first wanting to be a Catholic priest and then a Pentecostal minister with famed evangelist Aimee Semple McPherson. Quinn's family desperately needed money during the Great Depression, so he took several odd jobs including boxing and working as an extra on films. Quinn was a talented artist and draftsman and he dreamed of becoming an architect with Frank Lloyd Wright, but the money from the movies was too much for him to turn down. 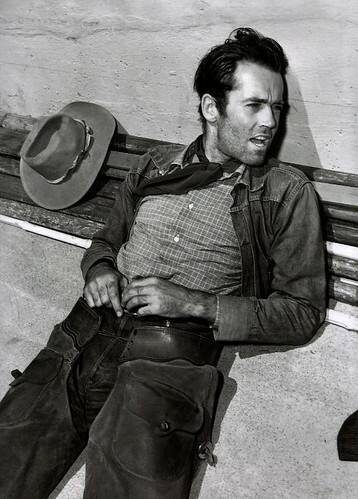 Henry Fonda on the set of The Ox-Bow Incident (1943). Quinn started out in small parts mostly playing heavies and American Indians. Quinn gained attention for his sympathetic portrayal of Crazy Horse in the Errol Flynn Western They Died with Their Boots On (1940), but he continued to be mired in supporting parts until he went to Broadway in 1948 to replace Marlon Brando in A Streetcar Named Desire. He returned to Hollywood in 1952 to play the brother of Mexican revolutionary Emiliano Zapata (Marlon Brando) in Viva Zapata! Quinn won a Best Supporting Actor Oscar for the role, making him the first Mexican-American to win an acting Academy Award. A vintage poster for The Ox-Bow Incident (1943). Quinn's role in The Ox-Bow Incident is one of the most memorable of his early career. He plays one of three men accused of cattle rustling and murder in a small Nevada town. The Ox-Bow Incident, based on Walter Van Tilburg Clark's 1940 socially conscious novel, is an unsparing account of a blood thirsty lynch mob. Lynching was still a large problem in the American South, and director William Wellman had a difficult time convincing 20th Century Fox chief Darryl Zanuck to green light a film on such a hot-button topic. 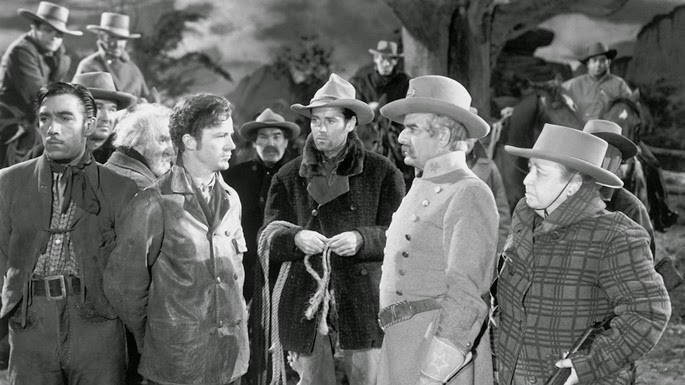 Gil Carter (Henry Fonda, right) captures Donald Martin (Dana Andrews) in The Ox-Bow Incident (1943). The Ox-Bow Incident tells the story of two cowboys (Henry Fonda and Henry Morgan) who ride into Bridger's Wells, Nev., in 1885. The men are just looking for a quiet shave and a drink in the local saloon, but the whole town is in an uproar over the supposed murder of a rancher. Fonda and Morgan soon realize they're going to become the prime suspects unless they join a posse looking for the criminals. 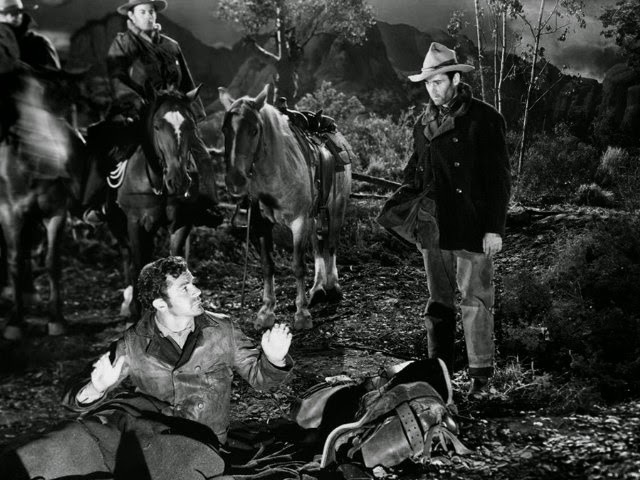 The posse stumbles across three men: a devoted family man (Dana Andrews), a Mexican gambler (Quinn), and a confused old man (Francis Ford, brother of the great director John Ford). They quickly decide that these men must be guilty and they plan to hang them without a trial, despite the strenuous protests of a local merchant played by Harry Davenport and Fonda -- Fonda is the go-to old Hollywood star for saving innocent people from hanging. He does it (unsuccessfully) here and in Young Mr. Lincoln (1939), My Darling Clementine (1946), and of course, 12 Angry Men (1957). 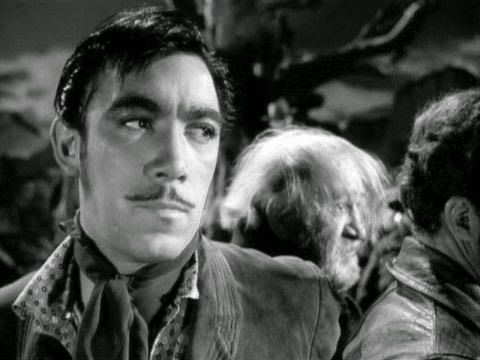 Anthony Quinn in The Ox-Bow Incident (1943). Quinn's character is the least sympathetic on paper: He is a gambler who may be guilty of murder, although he is innocent of the murder of the rancher. Quinn imbues the character with a great deal of dignity, which is unusual for forties cinema, where most Mexican roles were comic relief. He makes it very clear that his character is better educated than most of his captors and he insists on being treated with dignity, refusing to speak English when his captors are trying to demean him and requesting food and medical attention. 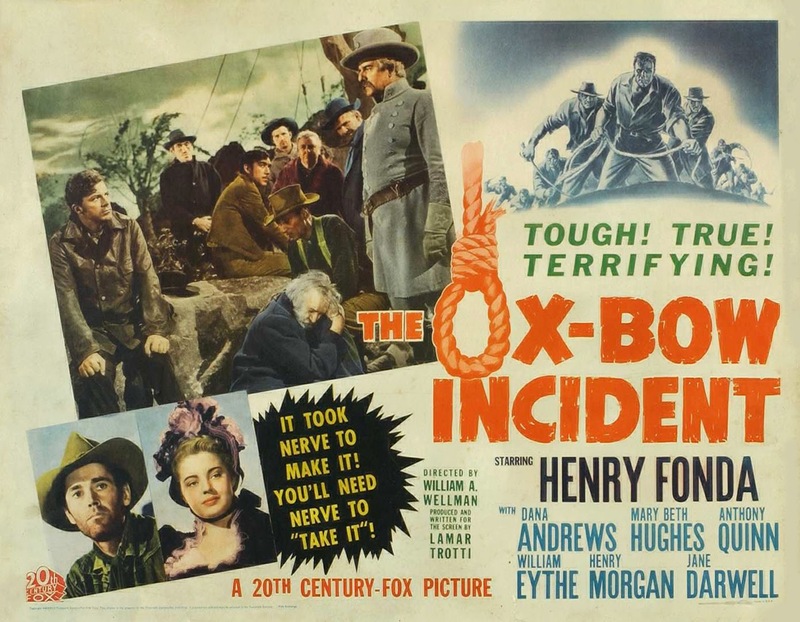 The Ox-Bow Incident was not a huge hit, although it won rave reviews from critics and was nominated for Best Picture at the Academy Awards. The film has gained a reputation through the years as one of old Hollywood's greatest Westerns and its theme's of mob violence and social injustice are still relevant today. The Ox-Bow Incident is available on DVD and video on demand. As seen in the trailer, this was a personal project for Fonda, who'd seen the aftermath of a lynching as a boy. Darryl Zanuck would produce a non-commercial film for him on a barter basis, probably a promise to do Daisy Kenyon. Thanks for the info! Fonda certainly gives a great performance in the film.